What are the benefits of having an offline World Clock Software? A world clock on your Windows desktop can help you significantly with organizing your daily life, if you are dealing with people in different time zones. Employees must know the office hours for their collegues and customers in other countries, brokers have to know the opening hours of stock exchanges. And for everybody else it is good and useful to know what time it is in a distant city, where a friend or relative is living, so you know when you can call him or her or expect an answer to an email. Although it is easy to find websites that show the time in other time zones, it is inconvenient and time consuming to find the exact information you are looking for online, on an ad-cluttered website. 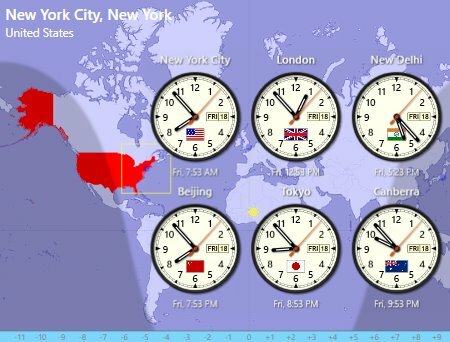 Sharp World Clock works offline on your desktop instead - you can have an always accurate world clock program, hidden by default if you like, but visible on demand to show the exact time in any major city on earth. There are more time zones than you probably are aware of, ranging -12 to +12 hours from UTC and many of them follow complicated daylight saving rules. These rules have to be considered besides the UTC deviation, which makes it difficult to calculate the time difference of two cities, without having a dedicated world clock program. In the northern hemisphere daylight saving rules are in place during the months of summer, while in the southern hemisphere it is active during the winter. Sharp World Clock uses an integrated list of currently 357 IANA time zones, which is updated about 3 times a year. 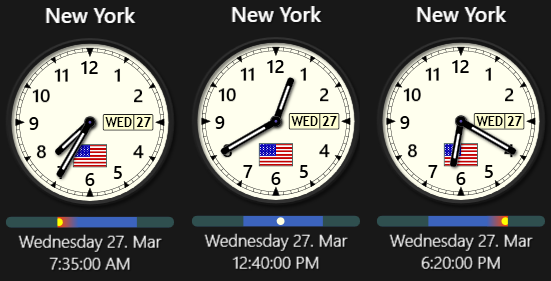 Besides being able to show as many clocks as you like, in every possible design and configuration, this world clock features several additional functions and components, like weather report, alarms, a time zone converter, a calendar widget and more. This world clock is not just an ordinary time tool, but also an attractive decoration for your desktop and a useful collection of tools for your daily life. Once you have tried it, you will not want to live without it anymore - and a lot of users confirmed that in enthusiastic reviews. Give it a try and join thousends of satisfied users all over the world! Select a preconfigured design from the visual gallery and tweak it as you like! Change fonts, hands, colors, borders, markers, date window, numerals, country flags and more. Clocks can be styled as a group or individually and are losslessly resizable. All functions but the weather report work off-line, without internet connection. Daylight saving rules for each time zone are obeyed accurately, using an integrated time zone database from IANA.org, which is updated 3 or 4 times a year. There is no loss in visual quality, when resizing the clocks: they can be tiny or huge and anything in between (the graphics are using WPF, which is a layer on DirectX). Clocks can be in analog or digital mode. Country flags, borders are optional, like all other details. You can modify colors, fonts, borders, date/time format and everything else for all clocks or individually. Clocks can be in a row, line or grid or single (undocked). If not needed all the time, they can be hidden and shown with a hotkey or a click at an undocked clock. The integrated Time Zone Converter can easily convert the time from one time zone to another. Daylight Saving is taken into account precisely, thanks to the most accurate and up-to-date IANA time zone database. The Meeting Planner makes arranging meetings across multiple time zones a snap. One of the integrated tools of this world clock is a world wide weather report, which is updated every 2 hours. 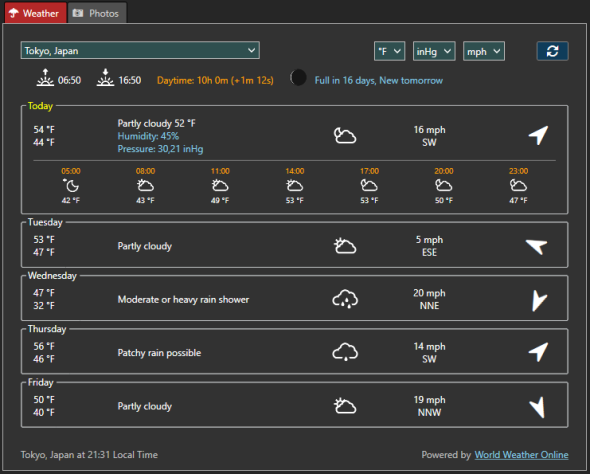 It shows the current weather conditions, a 3-hours-interval forecast for the current day and the forecast for the next four days, with minimum/maximum temperature (°Celsius or °Fahrenheit), wind speed and wind direction. Also shown are the sunrise and sunset time and an icon of the current moon phase, with information about the next full moon and new moon. Date/Time strings in the interface are using local language settings (here: German), but the digital clocks can use any language for the time and date. You can easily distinguish cities within and outside a certain time span ("office hours", the default is 8 AM - 5 PM) by dimming clocks outside that time span. This is adjustable from 0% to 90%. Instead of office hours you can also select the daylight hours (time between sunrise and sunset) of every city in the world clock. The size of the clocks in Sharp World Clock can be changed from tiny to huge - without loss of visual quality! All graphics are rendered vector based and hardware accelerated, using the most advanced and modern WPF technique. In Sharp World Clock the clocks can be arranged any way you like - as a horizontal line or a vertical row and any type of grid. The distance between the clocks is changed with the "Margin" slider in the settings dialog. You can undock clocks from the main window and place them anywhere on the desktop. After being undocked, they can be docked again. This is just one of the many magic features of Sharp World Clock. 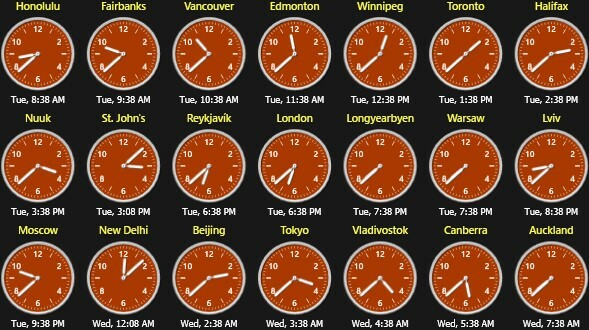 This world clock features 13 variations of hour/minute hands and 10 variations for second hands available and 6 variations for numerals: 4/6/12 positions upright, 12 positions rotated, 4/12 roman numerals. The last clock shows the 24 hour mode, where the hour hand makes a full rotation in 24 instead of 12 hours. The sky strip is an additional indicator for the day/night status of a city. It shows a symbolic representation of the sun, moving at the sky from sunrise to sunset. The height is adjustable (in the screenshot the height is set to 15 of 1..20). During the night the strip is shown black. For users on the southern hemisphere of the earth the direction can be changed from left->right to right->left. The sky strip can optionally show the office hours status instead (or additional to) the sky simulation. The first and the last hour of office time is shown in a different color. Instead of cities you can select UTC/GMT or military time zones for the world clocks - just select "Time Zones" in the continent list and select the time zone in the city list. Chimes and "Speak the Time"